When was the last time you visited your dentist or dental hygienist? If you’re one of the many people who avoids seeing a dentist unless you have a toothache, you may not realize your oral and dental health can have a significant impact on your overall health. In fact, an infection in your mouth can trigger sepsis, just as an infection in any other part of your body can. Infections in your mouth can occur in a tooth through an undetected cavity or crack, or through cuts in your gums, cheek, or tongue. Infections can also develop after dental work, because bleeding may occur during the procedure, leaving an opening for bacteria to enter. Sometimes incorrectly called blood poisoning, sepsis is the body’s often deadly response to infection, including dental infections. Worldwide, one-third of people who develop sepsis die. Many who do survive are left with life-changing effects, such as post-traumatic stress disorder (PTSD), chronic pain and fatigue, organ dysfunction, and/or amputations. World Oral Health Day is marked every year on March 20, organized by the World Dental Federation to help raise global awareness of oral health. According to the American Dental Association (ADA), one-third of Americans do not see a dentist regularly. This is for a variety of reasons, ranging from not understanding the importance of regular dental care to social issues such as having limited finances (having to choose between basic needs and dental care) or limited mobility, making it difficult to reach a dental office. Regular oral care should start early though. The American Academy of Pediatric Dentists recommends that babies have their first check-up when their first tooth appears, and before their first birthday. This care should continue right through to the end of life, even for people who no longer have teeth. 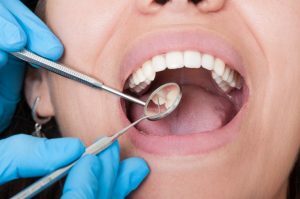 This is because dentists don’t just examine and repair teeth, they examine and diagnose problems in your entire mouth, such as oral cancer, blocked salivary glands, and any abnormalities that may appear. It is true that dental care can be expensive, but preventative care with regular in-office cleaning and check-ups can not only prevent cavities, it can help detect problems in your mouth in the earlier stages, when they are usually easier – and less expensive – to treat. The U.S. Department of Health & Human Services has a webpage with resources to help people find low-cost dental care, if needed. To learn more about oral health and sepsis, including the signs and symptoms of an infection in your mouth, visit Sepsis and Dental Health in the Sepsis and… section of the site. To find stories about people who have had sepsis following a dental infection, visit FacesOfSepsis.org. And if you have a story to share, please click on the Send Us Your Story link on the Faces of Sepsis page.